Welcome to the Central Arkansas Junior Team Tennis League Page! Here you will find the most up-to-date information about our program, registration information, schedule updates, and much more. USTA Junior Team Tennis brings together boys and girls, ages 5 to 18, to play singles, doubles and mixed doubles against other coed teams in our area! Need a team? Click here! The Junior Team Tennis track is designed to introduce kids to team competition in a setting that focuses on play opportunities, developing skills, and FUN. Teams in this program have the opportunity to compete at the annual State Championship event but do not advance beyond that. Teams are gender neutral and require a minimum of 3 players. Beginner and Intermediate divisions only. 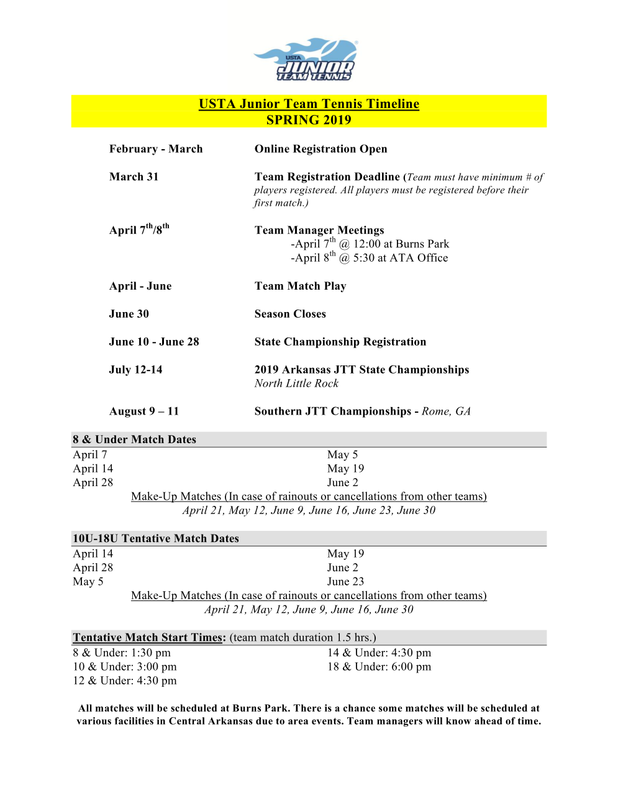 The “Championship” Junior Team Tennis track is designed to allow advancement from local competition to State, Section and *National championship events for 10 and under, 12 and under, *14 and under, and *18 and under. Teams are co-ed and require a minimum of 3 boys and 3 girls. Intermediate and Advanced divisions only. Players are required to self-rate if they do not currently have a rating. Click here to learn more. *If you register in open registration but have a specific team or facility you want to play with, please email Kord after signing up with the name of the team and/or facility!